Remember those days when you had to use your landline and select which AOL phone number to dial into in order to connect for insanely slow Internet access? For most of us, dial-up is just a distant hazy memory, but for a couple million Americans, it’s still how they get online. AOL released its latest quarterly report on Wednesday, in which it states that 2.583 million Americans pay for some sort of AOL service. That’s a little more than half of the 4.99 million subscribers AOL had in the last quarter of 2009 [PDF], and down more than 600,000 users from a year ago, but still represents a nice chunk of change for the company. According to the report [via the Washington Post], the average subscription revenue from each user is $20.03 per month, meaning AOL is making nearly $52 million each month in subscription revenue from these people, some of whom get broadband or DSL service through another provider but are under the misguided notion that they have to pay AOL a fee to keep their e-mail address, or simply don’t notice that they are still being debited each month for service they don’t use. 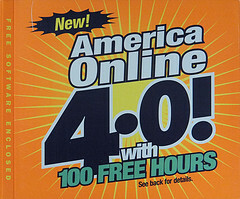 Some AOL users say they have no other option than dial-up, as broadband is not available in their areas. Others stick with dial-up because it’s less expensive than the monthly cost of higher-speed services. We’re guessing these people aren’t doing too much Netflix streaming. Dial-up and many DSL users are falling victim to telecom companies’ neglect of their copper wireline systems. As consumers continue to drop landlines, a number of these companies have said it’s simply not worth the cost of maintaining the network. For instance, in a few New York and New Jersey towns hit particularly hard by Hurricane Sandy, Verizon is testing a system that replaces the damaged copper network with a wireless service called VoiceLink. The problem is, it doesn’t work with slightly old-fashioned tech like faxes, credit card machines, remote medical monitoring devices, or home alarm systems, that many people rely on.